This just has to be one of the most pleasant experiences you can have when dealing with antiques. When buying antiques at boot sales and yard sales the collector has to be reasonably knowledgeable and has to make sure they know what they are buying. Boot sales and yard sales are not always the cheapest if the seller knows what they have. On the other hand boot sales are mostly made up of non-professional dealers. They are probably selling off what they’ve found in grannies attic and there are bargains to be found; if the collector takes the time to look. 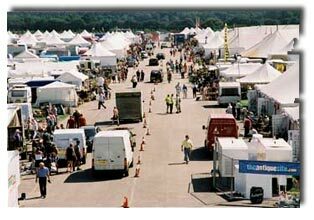 The best boot sales will be held regularly and will always be well attended by antique sellers, buyers and collectors alike. There will be regular sellers that buy their stock from general or antique auctions, and there will be sellers that aren’t as reputable as we’d like. It all makes for an antique bargain hunters paradise. Sound advice for those buying antiques at boot sales. 1. Arrive early — most of the quality items and the bargains will be gone by the time the lunch-time crowd arrive. 2. Be decisive — there are four hundred other bargain hunters behind you and if you’ve spotted that bargain early, then quickly check it is what you think it is and buy immediately. If you tell the seller you want to look around and you’ll be back later, don’t bother……the item won’t be there when you get back. 3. Don’t rush — take your time looking through a stall. Not hours obviously, but don’t just glance and walk on either. Most sellers don’t know what they’ve got and so don’t put the best pieces smack in your eye line. Look on the stall, behind the stall and under the stall….. you never know. 4. Talk — to the seller and be personable before you make an offer. A little chit chat can be worth a little more discount. 5. Haggle happily — Mentally decide what your best offer is, ignore any price ticket and start lower. Then haggle cheerfully and with a smile on your face until you both agree a price. The seller will enjoy it, you’ll enjoy it and the seller will remember you, and the pleasant experience, when they see you next time. 6. Don’t be afraid — to buy expensive items at boot sales. If you know what it is and you know what it’s worth and you’re happy with the price; then check it for restoration, damage and anything else, and buy it.